Retail $7.00 SAVE 20% ! I picked a box of these up a while a go. Must have been about 2 years ago. Figures are really good and the instructions are pretty straight forward. These would look good in a diorama. 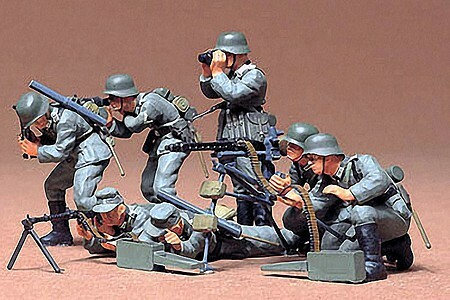 My only complaint is, why are all the machine gunners firing? I wish there was an MG teach on march. It would make this kit much more useful. But, its good for the price. One of Tamiyas older figure set. But, still very good. And, a great set to start your figure painting with. Keep small pieces and sharp edges away from children ages 3 and under.